After a week of drenching rain, and a few days of letting things dry out, I officially got to work in the yard ALL day today! So fun! Here is a shot of the water barrel I have near the corner of my house. 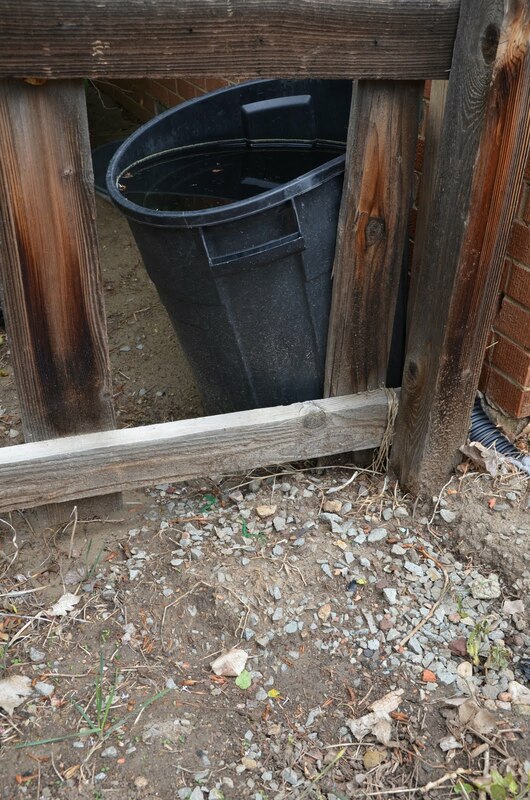 This catches the overflow from the drain, when it rains really hard the drain can't handle it, the extra water goes in the barrel. That barrel is completely full, its unreal! 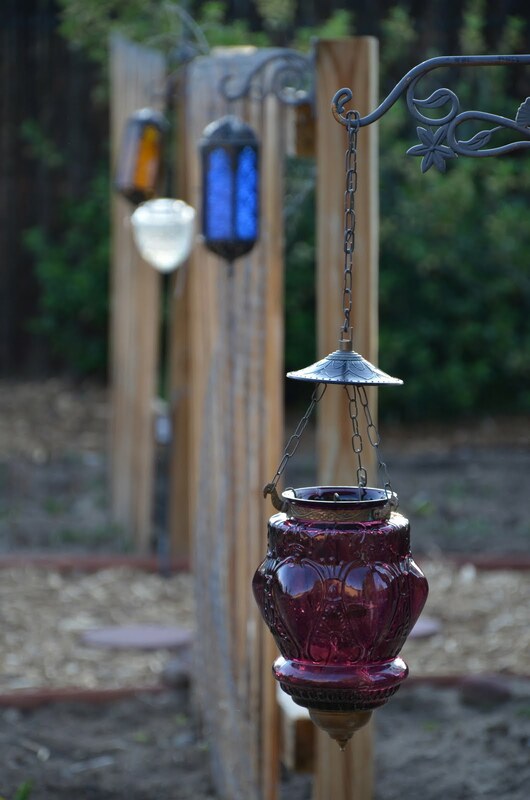 The yard is slowly coming together, I love the look that is showing itself to me. I have created a path through the garden beds that leads to the corner of the yard where I have a small table set for a relaxation and Nostrovia's :). You can see the middle bed is full of manure, I got a truck load last week, and ended up having a little to much. Until I get some good fill dirt to add to the manure I don't want to plant anything in it. Plus, I have been using it to add manure to other places in the yard, its coming in very handy! I got so much done today, cleaned up all kinds of areas, got rid of tons of rubber roof that was helping keep the grass down in a few places, weed whacked, and mowed down the seriously long grass back here. I also came upon the first snake of the season today, I was heading his way with the lawn mower which inspired him to move very fast and get out of the way, scared me a bit at first, but then he just sorta hung out out of the way. I was glad I didn't chop him into a billion little pieces with the new mower :). In a complete rookie move, I left all of my seeds outside the other day when it rained for 2 days, so they were ruined. After 2 seed box disasters, and then having the seeds soaked by the rain, I had to buy new plants. I am a bit sad about it, but I think there might still be a few seeds I can save, there are a few things in the garden I am going without, but, there is plenty to keep me busy, and I can add more later if I need to. I got everything I have in the ground, 3 varieties of pumpkins, watermelon, musk melon, okra, sage, brussell sprouts, bell peppers, more garlic, eggplant, onion, tomatillo, winter squash, zucchini, beans, squash, and all the flowers. I have a few flowers blooming that I got at the garden center, and I love them! I love having color in my yard so early! 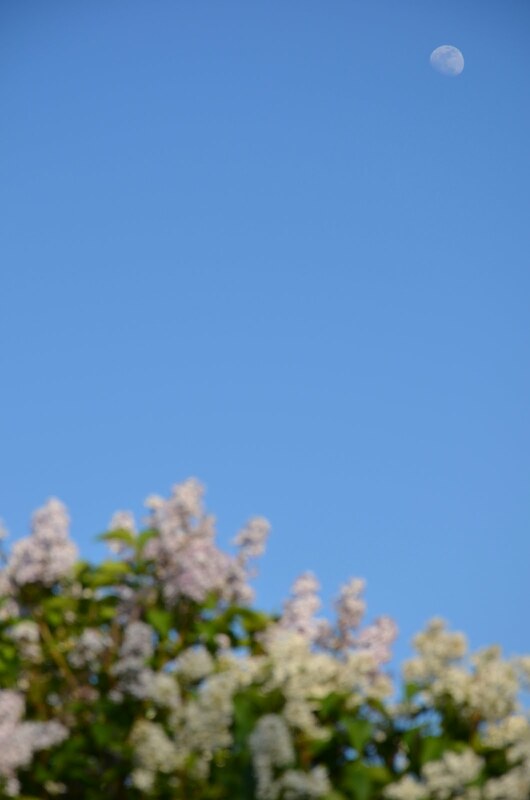 I was sitting under the tree looking at this flower the other day, and I noticed a bird out of the corner of my eye. He was trying to get a very long piece of string that was wrapped around some rod iron in the garden. He would bundle it all up in his beak, then fly away only to be pulled back down because the string was still attached. He would land, kinda stomp about in what seemed to be a bit of frustration, then, taking great care to get as much string in his beak, he would try to fly away again. It was very cool to watch, he tried about 5 times before he finally gave up and flew away. Since I have no policy about butting into mother natures business in my yard, after he flew away, I walked over, untangled the string from the iron, and laid it on the ground. Hopefully he will come back for one more try and will find it a bit easier. 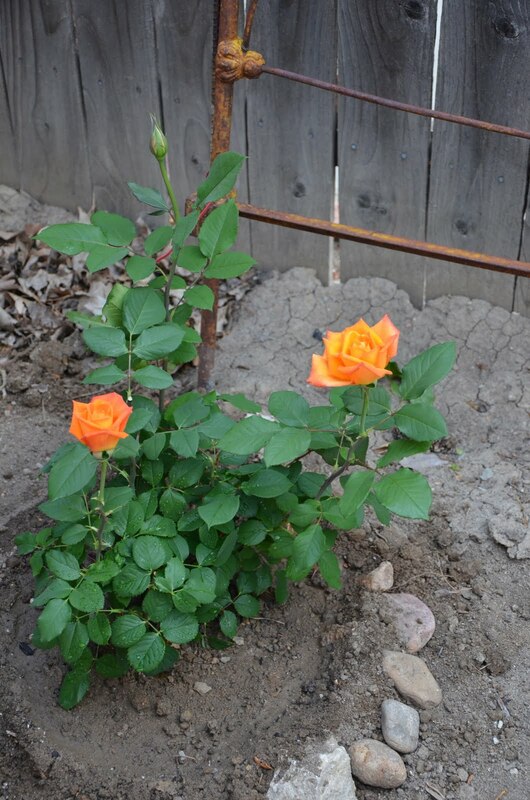 I also planted 3 new rose bushes last week, all of which already had blooms on them. 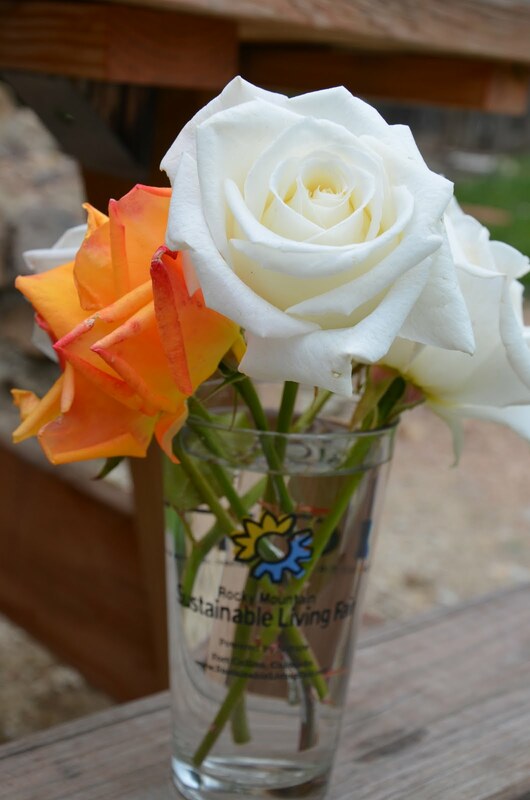 I am so excited to already have a couple of bushes giving me roses, I know they are about past their prime, but I just can't help holding on to them for day or two, they are so pretty! Happy weekend, Thanks for stopping by to check out the pics and what things I have going on! 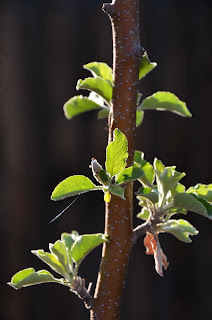 I am super excited for all the things still to come in the garden, so keep checking back! Have a beautiful day! It has rained here for a few days giving the garden a lovely soaking, but, hampering my plans of working in the yard all day today. Looks like I will have to wait one more day, unless more snow moves in tonight. 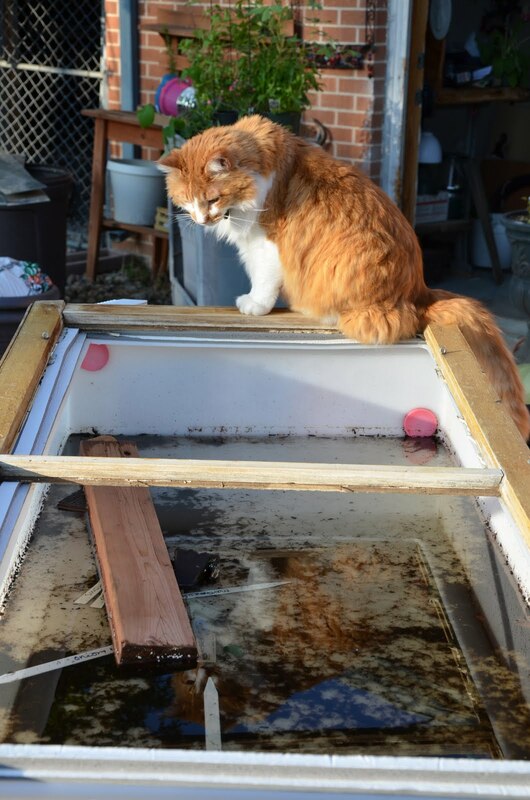 My seed box was destroyed by the wind, then it was filled with water after the rains. I moved my seeds into a temporary seed box, but that box got flooded and I am not sure the seeds will be able to dry out and be saved. Looks like a trip to the garden center is in store for me for sure this year, which, really is never a bad thing. 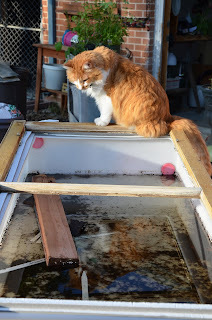 Sir Artemis is checking out the seed box, he used to lay on the glass, so I think he is mourning the seed box as much as I am. Even though I can't work much in the yard today, things are coming along, and I am very excited for summer and the chance to hang in the yard with family and friends. 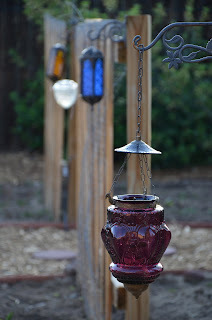 I have a few more lanterns to hang, and lights to hang along the fence's but its starting to reflect more of me finally! The rains have made everything green super happy, and has helped get my asparagus up!! This is a first for me, I have never grown it before. I can't wait to see the life of this plant, I have plenty time to watch it since I cannot harvest it for a few seasons. 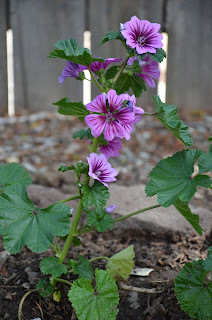 When I saw them coming up I did a little dance in the garden, I am so excited to see this new plant!! While I wait for better weather to get my seeds right in the ground and get more plants on the way, I simply wander around my yard enjoying all the things that here for me to love, the lilacs right now are my absolute favorite thing! The apple tree is blooming, the raspberry plant made it, the potatoes are going strong, asparagus is up, the sage is going strong, and all my roses managed to make it as well. (thought I lost the Kennedy white rose *whew*) Just like me, there are many things coming to life in my garden this spring, its a lovely place to be! Gardening is so good for my soul! In the yards next to me there are a total of 8 dogs that bark at me through the fence while I am working outside, usually they stop when I call them by name, or when they just get tired of it. Snapped this shot over the fence of Ace (smaller one) and Lilly barking at me. There is one more dog in this yard, but she is out of the shot. I do love my neighbors, however, sometimes with at least two dogs in every yard that surrounds mine, (and 3 dogs in a couple of them) it gets a little noisy. Either way, they are part of my yard experience so It thought I would get a pic. Check back soon, I am hoping to get the cotton in the ground in the next day or two, and can't wait to see that take off, as well as the tobacco!! Happy weekend everyone, enjoy the photos! This week brought many new things to the garden. I have planted 3 new kinds of mint, Spanish Lavender, garlic, two new rose bushes, blanket flowers, and my lilacs are blooming. 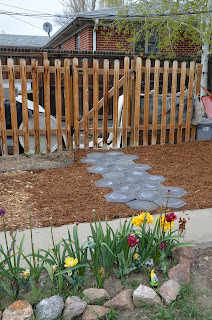 I finally have most of the mulch where I want it to stop so many weeds from taking up all my time this summer, and have managed to continue to work on the lay out of the garden, and general design of the yard. 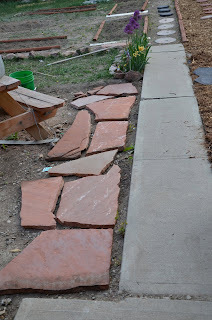 A friend is giving me some flagstone he was not using, which is a generous gift and will look amazing as my new patio. I couldn't resist putting a few pieces down tonight just to get a feel for the look. The wind has been insane here this spring, normally not that big of a deal for me, but I am sick of it now. 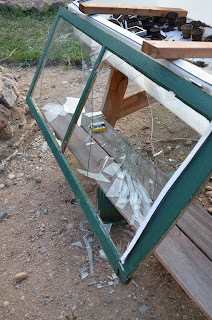 It pushed open one of my seed boxes and destroyed the glass in the window, but did not damage any seeds. 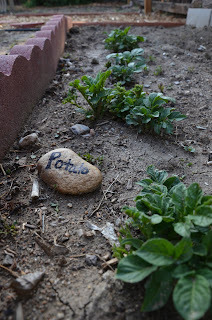 As this was my second attempt at seeding, and I am succumbing to the idea of buying some plants this spring, and sowing many directly into the ground as well. 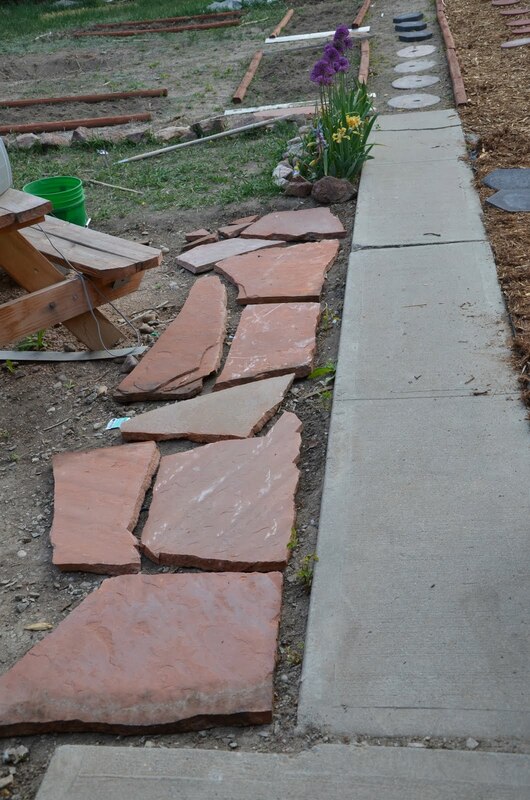 There is still much to do, but things are coming along so nicely, I just can't wait to see what else brings it self to life in my yard. I love spring, so many possibilities of what is to come! I noticed this one lone dandelion growing out of a rock in my rose garden tonight. I just sat checking it out very closely for awhile, thinking about it, is it really a weed? Didn't I read someplace of all the cool vitamins it carries, and aren't the roots wickedly powerful? How did it come to be I always thought it was merely a weed? This dandelion, standing so upright, reaching to the sun, growing in the smallest bit of dirt on a rock, this dandelion captivated me. It is considered a weed by most, and a medicinal powerhouse by others. Normally I would have just walked right over and plucked this little yellow dandelion from its carefully built home, but today, I just observed. Funny the things you think about when you slow down, take a breath, and look around. I have been struggling to find my own hidden strengths lately, and here I was finding many in this yellow bit of weed, slowing down to take a look, I realized the point in my own life, that I was about to miss. It makes me wonder what we could find inside us when we take the time to look closely, and redefine some things, we might see more then we ever imagined. Weed to herb, loathing to love, sick to healing, despair to hope. So glad I sat and played in the dirt today :) who knew what I would unearth about myself while looking at weed. I know it looks like a lot of mulch in the yard, however, I'm hoping that it's a lot of area I wont have to weed all summer again!! :) YAY!!! 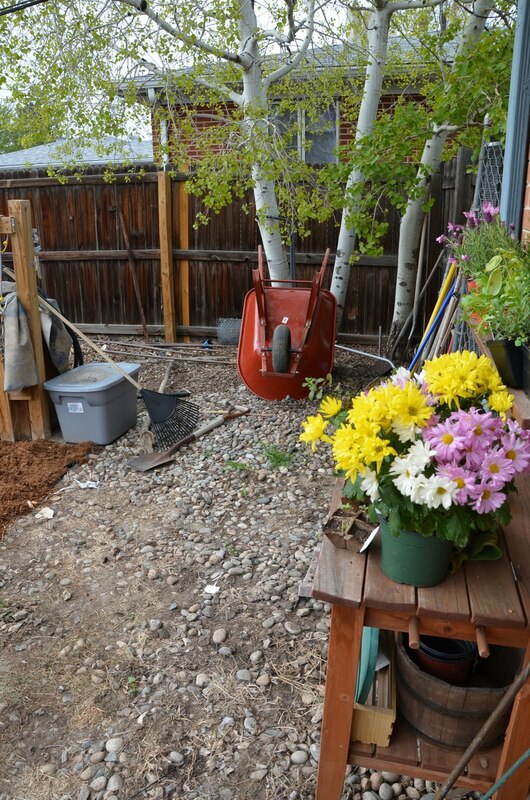 It was a joyous relaxing weekend, took lots of naps, read a bunch, and worked in the yard, it was a perfect weekend. Hope yours was wonderful too, have a happy week!